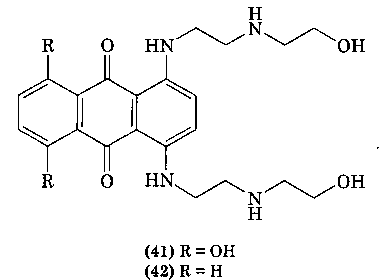 Many of the synthetic compounds developed from the original natural product lead were also extremely potent and showed broad-spectrum activity in human tumor colony-forming assays (88), and both adozelesin (22) and carzelesin (23) proceeded to clinical trial. However, adozelsin had only marginal efficacy in a phase II trial of untreated metastatic breast carcinoma (89). Similarly, carzelesin showed no activity in a phase II trial in patients with a variety of advanced solid tumors (90). A phase I trial of KW 2189 (24) established the maximum tolerated dose at 0.04 mg/m2/d when given daily for 5 days, with leukopenia, neutropenia, and thrombocytopenia as dose-limiting toxicities (91). A phase II pilot study in metastatic renal cell carcinoma showed a good safety profile but no activity (92). Figure 2.4. 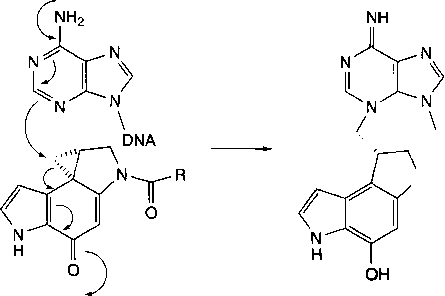 Alkylation of DNA by cy-clopropy lindóles.